Paper presentation ‘Women’s leadership within Latin American musicians’ union: opportunities and challenges’, International Women and/in Musical Leadership Conference, Senate House, London, 7/02/19. Invited panel contribution ‘Music and copyright, money and morals’, 100 Years of Copyright Festival, Haus der Kulturen der Welt, Berlin, 19/10/18. Invited talk ‘PPL and the management of performers’ rights’, Law School, University of East Anglia, Norwich, 9/05/18. Invited talk ‘“Working closely with their employers”: performers and PPL’, Faculty of Arts and Creative Industries, Middlesex University, London, 23/01/18. Paper presentation ‘The management of performers’ rights’, Working in Music Conference, University of Lausanne, 11-13/01/18. Invited talk 'Making a living in music', Goldsmiths University of London, London, 21/11/17. Paper presentation ‘Negotiating change: the Fair Internet for Performers Campaign’, International Association of the Study of Popular Music (IASPM) Biennale Conference, University of Kassel, 26-30/06/17. Invitation-only workshop 'Performers' rights in Europe: challenges and opportunities', AEPO-Artis, Thon Hotel EU, Brussels, 6/06/17. Invited panel contribution 'Convergence or differentiation? Copyright protection and business models in China's digital creative cultural industries', University of Edinburgh, 5/06/17. Invited talk ‘The Fair Internet for Performers Campaign: the challenge of legislative change’, Intellectual Property Discussion Group, Faculty of Law, University of Oxford, 29/11/16. Invited roundtable contribution for the ‘Dissecting the Digital Dollar’ Project, Report commissioned by the Music Managers’ Forum and the Featured Artists’ Coalition, MMF Office, 13/05/16. Paper presentation ‘Distributed ownership: the place of performers’ rights in musical practice’, Performers’ rights: an evening of discussion and performance, New IP Lawyers, Digital Catapult, 18/04/16. Invited contribution to an international workshop on musical instruments, Reid School of Music, University of Edinburgh, 08/04/16. Invited contribution to a workshop on copyright-related litigation, School of Business and Management, Queen Mary University of London, 9-10/03/16. Colloquium '”I love making music”: considerations on creativity and labour in the digital age', Department of Music, King's College London, 19/11/2015. Public lecture 'Who decides what I listen to next' with Kariann Goldschmitt, Cambridge Festival of Ideas, 24/10/2015 (fully booked, 40 places). 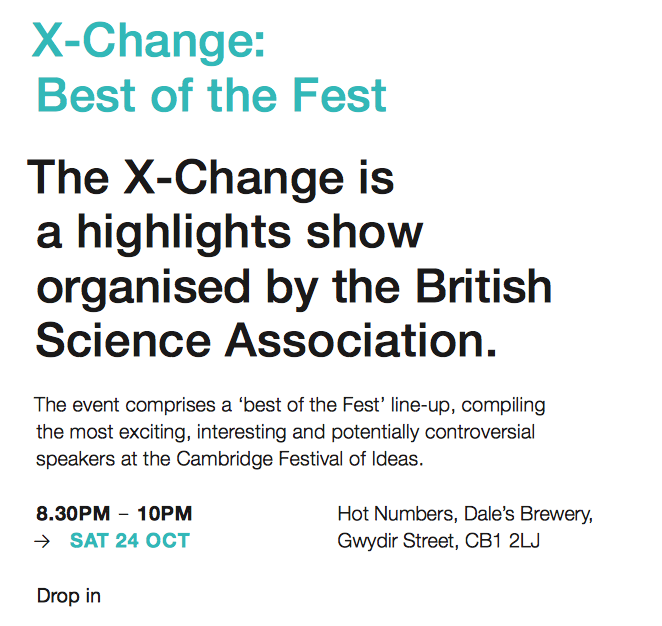 Invited talk at X-Change, British Science Association, a selection of five highlights of the Cambridge Festival of ideas, 24/10/2015 (full house, with ca. 60 attendants). Panel convener ‘The music industry in the digital age: creativity, labour and regulation', RMA Annual Conference, University of Birmingham, 8-11/09/2015. Invited talk 'Law and norm of music performance' at the one-day interdisciplinary conference 'Law and norm of music borrowing', Law School, University of Birmingham, 13/07/15. Paper presentation 'The hitchhiker' guide to the world wide web: making music in the digital era', 18th Biennal IASPM Conference 'Back to the future: popular music and time', Universidade Estadual de Campinas, 29/06-03/07/2015. Invited talk 'Towards more proactive theories of creative labour' at the one-day interdisciplinary and international conference 'Creative labour(er): anthropological perspectives on the work of art', Department of Social Anthropology, University of Cambridge, 08/06/2015. Invited talk 'Distributed ownership: the blurred lines between composition and performance', Copy / CTRL, Department of Music, Goldsmiths, University of London, 08/05/15. Workshop 'Creativity and Technology', Law Faculty, University of Cambridge, 15/04/15. This event discussed opportunities that have opened up to contemporary performing musicians due to technological developments and the legal, economic and political frameworks within which these are exploited. It was chaired by Lionel Bently (Law) and speakers and guests included Tanya Aplin (Law), Nick Prior (Sociology), Jason Stanyek (Music), Ruth Towse (Economics), Alan Blackwell (Computer Science), Lilian Edwards (Law), Georg von Graevenitz (Management), Nicholas Cook (Music) and Georgina Born (Music). Paper presentation 'Between authorship and performance: legal categories of creativity and labour', RMA Study Days 'Authorship in music', University of Oxford, 6-7/03/2015. Colloquium 'Navigating the music industry: explorations in creativity, technology and law', Music Faculty Colloquia, University of Cambridge, 19/11/14. Workshop 'Creativity and Institutions', Alison Richard Building, University of Cambridge, 9/12/14. This workshop explored the institutions—aesthetic, legal, economic or other—that musicians of all backgrounds navigate in order to earn a living. It was chaired by Nicholas Cook (Music). John Street (Politics), Stephen Cottrell (Music), Martin Kretschmer (Law) and Andy Pratt (Geography), Christina Scharff (Creative Industries), Joe Bennett (Music) and Anne Barron (Law) presented their work. Keynote 'The value of performance in law: performers' rights and creativity' at the CRASSH Conference 'Creativity, Circulation and Copyright: Sonic and Visual Media in the Digital Age', Centre for Research in the Arts, Social Sciences and Humanities (CRASSH), University of Cambridge, 28-29/03/14. Guest contribution 'Sitting in the studio: performers and producers observed', Art of Record Production 'Performance in the Studio' Online Conference, 29/04/13. Respondent to Professor Georgina Born at the 'Music and Digitisation: Intellectual Property, Cultural Commons and Ontological Politics' Workshop, Faculty of Music, University of Oxford, 12/01/13. Invited contribution to the HERA Workshop 'Authorship Dynamics and the Dynamic Artwork', Faculty of Law, University of Cambridge, 15/12/12.